Property Buying in Singapore - What should you know? Paul Ho (iCompareLoan.com) 20 May 2017. Everyone wants to know how to make money from buying and selling properties or making a rental yield. But should you read news about property sell-out launches of 300 units, 500 units to determine whether this is the right time to buy? Is this the right price to buy? Do you determine that the market has recovered? Then you jump in and buy, and perhaps overpay for the properties. You will be in for a long hard wait and potentially lose a lot of capital. What about the other unreported cases of slow sales? Do you hear about it? Remember that the market has a habit of celebrating success, we talk about good things, this tends to skew opinions. Those who got burnt don’t brag about it. You will never hear about, “Oh I invested in this, I was so stupid and I lost $300,000.” or “Property launches, mostly unsold”. Selling out of 3,000 units (10 x 300 units), is this a good result? It has to depend on what is the annual take-up consumption trend (Sold). If the Annual take-up rate of property sales is 10,000 units, the market is only able to move 3,000 units (Sell out) and the rest of the market struggles to sell another 2,000 units for a total of 5,000 units will you then have read the market wrongly? Let us review another headline “2017 Annual take up rate of 5,000 compared to annual average of 10,000 units”. Do you feel more negative about this headline? They are both the same thing, they are not lying, but the frequency of reporting every little success gives the impression of a very successful and rising market. In order to correctly understand the market, we need to properly model the market to capture all the inputs and outputs. A proper model should try as best as possible to capture all the inputs and outputs. Here is a simplified analysis of the factors you should consider. Request a full detailed Property Research Report at www.iCompareLoan.com/contact . Where is the supply of Property coming from? The additions are reflected in the Supplies coming from the Master plan, land available, zoned and un-zoned, Government Land Sales – Reserve List, the Government Land Sales confirmed List, Bid and won projects and its land size and plot ratio. The property supply is also in part determined by the land it sits on. For example the land’s soil test is suitable for a higher plot ratio and in accordance with the master plan, a lot more supply can become available. The developers then bid for the land plot. Singapore is an open market where foreign developers can participate in bidding for the land, this means that the land will always sell for optimal high prices. The amount of supply that comes into the market depends on what the developers think they can sell the property for. While incomes have stagnated, the only way developers can match your affordability price point and still make money is to make the units smaller. Therefore the property prices may remain stable, while the per-square-feet prices keeps going up. Time to Rethink - Land is scarce in Singapore? Yes, land is scarce in Singapore. But there is no lack of housing units as units can come from Rezoning or increase plot ratio use. 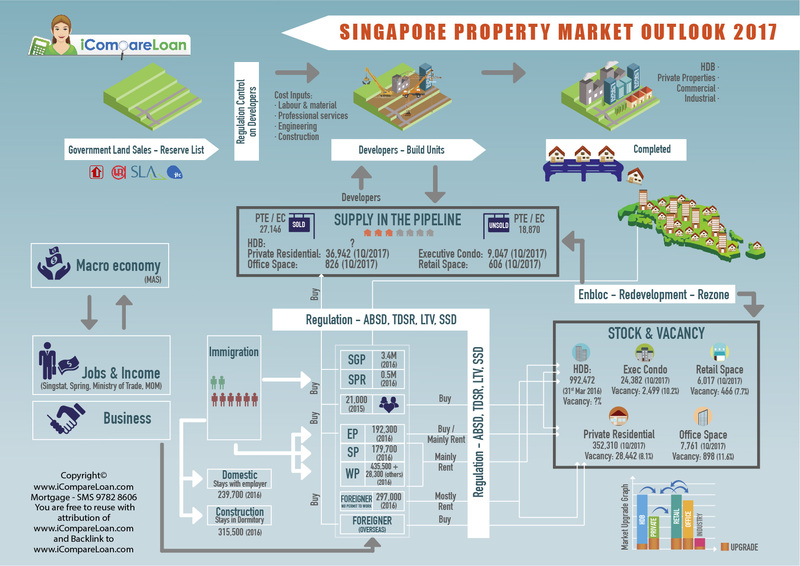 Singapore property market outlook and model for property investing. Use this info-graphic and fill in the numbers yourself to understand whether the market is right or not right. Where does Demand of Singapore Property come from? Demand comes from population. Population in Singapore comprises Singaporean, Singapore PR, Employment Pass (EP) holders, Special Pass (SP) holders, Worker Permit (WP) holders as well as those with permission to stay in Singapore but not allowed to work, namely students, children of EP holders, etc. The demand depends on macro economic conditions, incomes and unemployment, but otherwise they should generally follow the population trends such as marriages and needs of marriages. The general economy dictates how much foreign population will be able to find jobs and be attracted to a country. Immigration and population policies also restrict or accelerate the number of foreigners in Singapore. Property regulation serves to constrict demand or outright restriction such as foreigners not allowed to buy landed property in Singapore. The regulations such as Additional Buyer Stamp Duty (ABSD) raises the price barrier for foreigners buying property in Singapore as well as for Singaporeans and SPR buying second and third properties. Seller stamp duty (SSD) serves to deter speculators from buying properties to flip in the short-term, this also reduces the “demand” as this demand is not real. Total Debt Servicing Ratio (TDSR) makes sure that people who want to buy properties genuinely can afford it. Foreigners need housing. Due to the high ABSD they tend to rent instead of buy. Foreigners in Singapore under Employment pass (EP) tends to rent private properties while some also rent HDB flats or rooms. Special Pass (SP) holders have smaller salaries, hence they tend to rent HDB rooms instead. Worker Permit (WP) holders also tend to create demand for HDB rental. Both SP and WP holders do not add to the property buying demand. Worker Permit (WP) holders who are domestic workers do not add to any room demand as almost all stay with their employers. WP holders who are construction workers stays in the designated dormitories, though some overflow to HDB flat bed rentals, typically 4 to a room. Singaporean and Singapore PR already have a high occupancy rate of 90.8% (2015) and a household size of 3.39 per household, hence the natural demand for housing is limited to marriages, younger children moving out. The rest of the demand are from investors buying 2nd property for renting out. Amongst the foreign population residing in Singapore, the largest cohort is SP and WP holders and they contribute to rental demand and not much to property buying demand. EP workers tends to be lesser, they tend to contribute to private property rental demand and some to HDB rental demand. Rental demand for HDB flats and room rentals potentially create some upgrade demand for Singaporean and SPR buying a private property to stay in while renting out their HDB flats. Some also sell their HDB if resale prices are strong and upgrade to private property to stay in. How is Singapore Property Prices Determined? Singapore property prices are determined by the amount of people selling and the amount of people looking to buy. Is it pure supply and demand? Not really. The prices will find a balance between Buying demand and Selling demand. If there are uncompleted properties in the pipeline and they are UNSOLD, this is automatically a “SELLING DEMAND”. This puts downward pressure on property prices. If there are uncompleted properties in the pipeline and they are already launched and SOLD (taken-up), then this does not pose downward pressure as it is not a “SELLING DEMAND”. However this puts downward pressure on rents when these units are completed. Rental demand is the factor supporting property investment prices. If more units are completed, then rental will be severely hit. Those who buy to rent out will be faced with issues. If rental yields drop, property prices will also face downward pressure. Buying demand comes from people buying for own use as well as for investment. Those who buy for investment will need to know that there is rental market for it. If there are a lot of foreigners, there will be rental demand and hence there will be investors looking to buy. This will put upward pressure on the price. How to buy a Property in Singapore? If you are buying to stay, do so within your affordability. Find out from a mortgage broker on how much you can afford and the many different financing options and make sure your TDSR or MSR passes. If you are buying to invest, only go for high quality properties in good location with historical strong rental demand. One important thing to ask your foreign friends will be, “if money is not an issue, where would you rent?” After you ask 30 to 50 people, you will get a feel of where the rental demand is. So always buy in those area where people want to rent, because when times are good, you can get good rentals, when times are bad, you rent it out cheaper, you will still be able to find tenants because of the desirable locations. Go for landed residential housing for store of value, though yields are very low, but be careful of your monthly installment load. Go for condominiums in prime districts well known for rental demand if you are investing, and understand your tenant market so that you can target them well.